There's nothing better than an exhilarating drive, except for an exhilarating drive at an exceptional price. Experience the 2018 Alfa Romeo Stelvio SUV at your preferred Italian luxury dealer, Southern Alfa Romeo of Norfolk today! Available in 6 exciting trims, the Stelvio gives you the power to choose your performance on the streets of Norfolk and the highways of Virginia. Don't wait! Test drive the Stelvio, Sport, TI, Ti Sport, Ti Lusso or Quadrifoglio now at Southern Alfa Romeo of Norfolk and experience all the luxury and performance for yourself. Our dealership is proud to serve drivers from the Norfolk, Chesapeake, Portsmouth, Hampton and Virginia Beach areas. Finally, a luxury performance SUV that's made for the way you drive! Available in 6 trims, the new 2018 Stelvio is perfect for drivers from all over Virginia. If you're looking for a great balance of power and performance, choose from the first 5 trims in RWD. The 2018 Stelvio base, Sport, Ti, Ti Lusso and Ti Sport all come equipped with Stelvio's standard 4-cylinder turbo that can deliver up to 280-hp and up to 306 lb.-ft. of torque at 4,800 rpm! These models can all go from 0-60 MPH in just 5.4 seconds and an EPA-estimated 33-MPG on the highways of Virginia! Upgrading to AWD will make these Stelvios go from 0-60 MPH in just 5.1 seconds! If you're looking for more performance, choose the legendary 2018 Stelvio Quadrifolio and go 0-60 MPH in just 3.6 seconds! This trim comes equipped with a 2.9L Twin-Turbo V6 that can deliver up to 505 horsepower and up to 443 lb.-ft. of torque at 5,500 rpm! All models come paired with an 8-speed automatic transmission for ultimate performance. Choose your favorite today at Southern Alfa Romeo of Norfolk and experience a thrilling new drive! The 2018 Stelvio is crafted as meticulously on the interior as it you would expect from an iconic Italian brand. Equipped with the latest tech to keep you connected and safe on the road, the 2018 Stelvio further compliments its modern and sophisticated interior with premium luxury features like supple leather seating, soft touch surfaces and more. Also standard on the Stelvio is an 8.8-inch color touch display that includes popular features like Apple CarPlay™ and Android Auto™, Bluetooth®, an 8-speaker audio system and more! As always, every Alfa Romeo you buy or lease from your preferred Italian luxury dealer in Norfolk comes with the Southern Hospitality Buyers Program. Visit Southern Alfa Romeo of Norfolk today and see how much you can save with our exclusive list of benefits included at no additional cost! Now that you everything the 2018 Alfa Romeo Stelvio has to offer, isn't it time you experienced it for yourself? 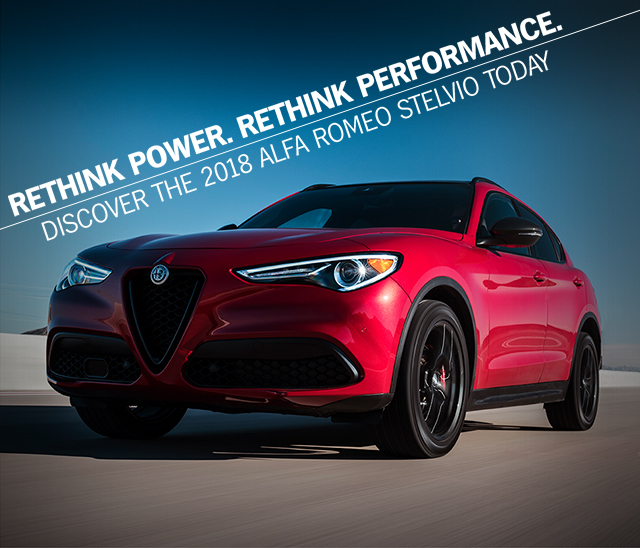 Schedule your test drive now by filling out the form, then visit Southern Alfa Romeo of Norfolk to test-drive the 2018 Stelvio in your preferred trim. Our Alfa Romeo dealership in Norfolk proudly serves drivers from Chesapeake, Portsmouth, Hampton, Virginia Beach and the surrounding areas.